LOS ANGELES, CA – August 14, 2017: CRN Digital Talk Radio announced today the launch of CRN PodPlus, a channel and stream that introduces the network’s national audience to podcasts centered around entertainment, celebrities, food, wine, and politics. CRN PodPlus airs on the talk radio network’s channel formerly known as CRN 7. Podcasts will air on CRN PodPlus, either in a rotation or during an assigned time, depending on the respective podcaster’s wishes. Like six of CRN Digital Talk Radio’s other channels, CRN PodPlus’s programming is syndicated on multiple platforms including television, set top boxes, WiFi radio, mobile apps, iTunes, Stitcher, Apple TV, Roku, the Web, and many other blogs, sites and apps. Podcasts will also air to CRN’s cable television audio channel audience – which numbers more than 11 million homes across the country. CRN PodPlus is also broadcast on a Roku channel and Apple TV radio stream. 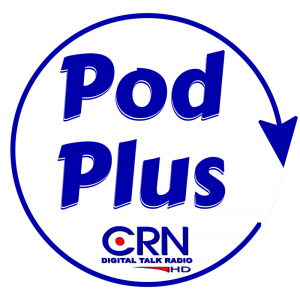 CRN PodPlus is also available on CRN’s mobile app, as well as several other radio apps such as Aha, Nobex Radio, oOTunes, TuneIn, and Wunder Radio. The channel is streamed on the Web via CRN Digital Talk Radio’s home page, CRNTalk.com. The stream is also accessible via telephone line by dialing 605-477-4255. Podcasters wishing to boost their production quality or simply get help starting their podcast will be able to use CRN’s Los Angeles studios.